This Scottsdale outdoor rock climbing excursion teaches you the essential belay-climbing techniques and gives you half-day to master them all. After a small trek into the desert, you’ll approach a giant lab stretching 60-feet into the sky. This is where the adventure starts! 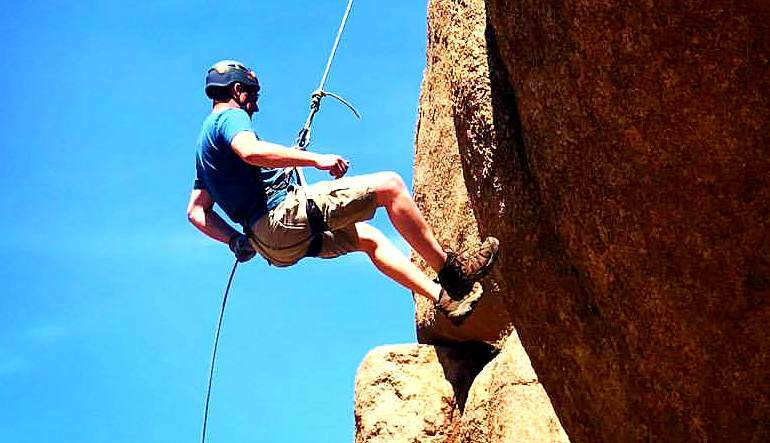 This Phoenix outdoor rock climbing excursion teaches you the essential belay-climbing techniques and gives you half-day to master them all. An ideal excursion for first-time climbers or those making the transition from indoor to outdoor climbing, the outing awards you with magnificent scenery. As you scale the rocky formation, take a minute to appreciate the high desert vistas and let your oneness with the natural landscape really settle in! Begin the half day Scottsdale rock climb with a 10-minute hike into the desert. Learn how to harness yourself and tie a proper figure 8 knot. Start scaling the rocky wall and get acquainted with the basic rock climbing postures. Rappel down and keep going! Try to be the first of your team to make it to the top! When it comes to rock climbing, a big part of the fun is devising a scaling strategy. As the half-day progresses, you’ll be mapping out your next moves, weighing which routes worked and which didn’t. You’ll see that after a few tries, you’ll be climbing way quicker than you ever thought possible!